The newly formed Los Angeles Improvement Company in December 1899 acquired a long-term lease on the old Washington Gardens site at Main and Washington Streets near downtown Los Angeles. 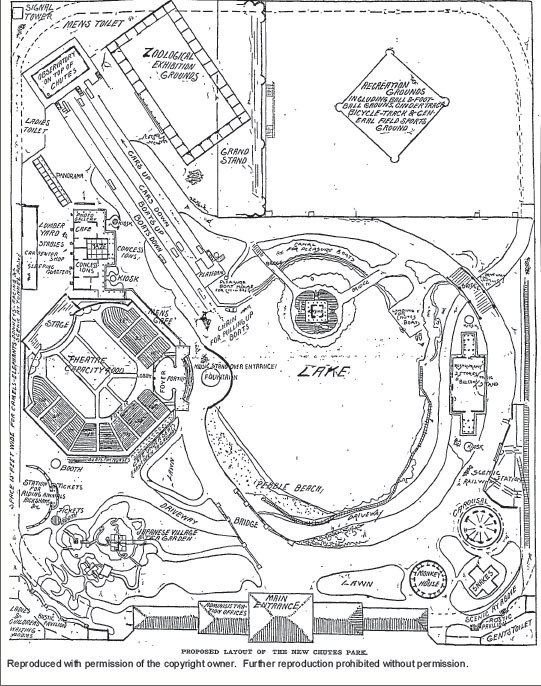 In August 1900 they unveiled plans to create an amusement park on the 12-14 acre site. Its centerpiece would be Paul Boyton's, 75 foot high Shoot the Chutes ride, where toboggan boats would slide down a 30-degree, 350 foot long ramp into a small lake. Other attractions included a Merry-go-round, Japanese Village and Tea House, Shooting Gallery, Bowling Alleys, Children's playground with pony and goat carts, Zoological Building, Modern Theater seating 4000 people, Baseball and Football Field, picnic grounds and a restaurant. Admission to the park would be ten cents and included one ride on the Chutes. The park opened briefly in the fall, but closed for four weeks on December 1st for renovations. The owners added the 1400-seat Chutes Theater for vaudeville shows, and enlarged the zoo; both at a cost of $35,000. The zoo featured boxing bears, three African lions, a huge sea lion and its mate, and a blood-sucking vampire bat. 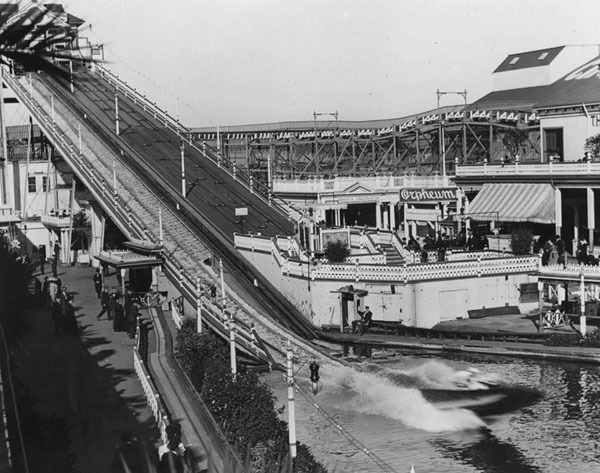 Along its main walk, called the Midway, were games like the fishing pond, which offered prizes for successful catches, and an area where circus acts, like Lunette - The Flying Venus, performed daily. There was additional free entertainment like daily balloon ascensions and the Catalina Marine Band. A miniature railroad took visitors for a tour of the entire park. 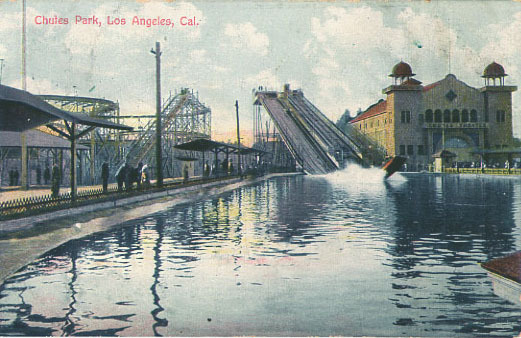 Additional rides and attractions included a Helter-Skelter slide in which passengers passed via short turns through a variety of mechanically changing scenery. There was a Laughing Gallery with distorting mirrors, and a Cave of the Winds, a chamber of horrors. Those who entered faced sudden gusts of wind powered by blowers that usually blew their hats off. During the spring of 1906, 36 Iggorottes, a fierce tribe from the Philipinnes were on exhibit at the park. Its difficult to determine how popular or even how profitable Chutes Park was during the first decade of the 20th Century. Most newspaper accounts were about the semi-pro Los Angeles baseball team that used the field during the spring / summer seasons. However, in October 1910 a new corporation purchased the 12-acre park and spent $200,000 to add at least a dozen new attractions for its planned June 10, 1911 opening as Luna Park. Foremost was the construction by the J.D. Thompson / Snow Co. of Nemo's Trip to Slumberland, an enormous $75,000 scenic railroad based on the popular and imaginative comic strip of a boy's dream adventures. It was a huge ride that ran the entire Main Street length of the park, and occupied a space 600 feet long by 75 feet wide. Its use of an electrically-powered third-rail allowed it to run three trains simultaneously as each train's operator could control the speed of his train as it climbed or descended, even accelerating downhill. While one train was 100 feet above the ground passing dark abysses and unscalable precipices, another was dipping through panorama-lined tunnels underground. While they decided to retain the Figure 8 roller coaster at the western end of the grounds, the old Shoot the Chutes was to be remodeled into a picturesque scenic water ride called Shooting the Rapids. Other planned attractions included the Battle of the Monitor and Merrimac ironclads using miniatures, a Dancing Pavilion, Tony Ryder's Monkey Circus, Billikins' Temple of Mirth (a crazy house), an outdoor skating rink, The House of Hilarity, two vaudeville theaters, the Big Captive Balloon ride, a Circle Swing, the zoo with an added elephant and several camels, and a burro and pony track that was free to children. Luna Park officially opened on June 10, 1911 to an evening crowd of 16,000 people. Besides its 24 attractions, its free daily entertainment included Stanley and Hoxiels's Congress of Rough Riders and Wild West Show, and a circus performance, twice daily, of Mme. Schell's ferocious lions in a great iron cage in the center of the lagoon. Shooting the Rapids opened a week late, but by then weekend crowds averaged over 30,000 daily, and there were long lines at Nemo's Trip to Slumberland. Management added a few additional attractions by mid-August. Passengers rode in large wash tubs down eccentric spirals from a dizzy height in a ride called the Fairy Gorge, and the spectacle The Destruction of the U.S.S. Maine in Cuba's Havana harbor replaced the Battle of the Monitor and Merrimac. In addition Robinson's Troupe of Southern Pickaninames performed. The following spring an attempt was made to make the park a little more interesting to families with children. New attractions included the House That Jack Built, an edifice suggesting a pile of ABC blocks with a score of mirth-provoking devices. There was also the Children's Half Acre full of slides and rides for the little ones. Adults had a choice of the Derby Auto Race Course, or the Falls of Niagara. Entertainment was provided by the Royal Italian Band, a 35-piece band lead by Professor Frank Gregory. While it isn't clear how the park did financially during its short life, it was sold on September 21, 1912 to a syndicate of Los Angeles Negroes (blacks) as a permanent pleasure ground for members of that race. W.H. Washington was its president and general manager. Their plans didn't work out, and on December 7, 1912 Harry Berry and Eddie Maier, owner of a local brewery and baseball team, bought the seven year lease of the L.A. Improvement Company. To build a better baseball park, they tore down all the buildings including the scenic railway, carousel and theater. However, Little Nemo in Slumberland was moved to East Lake Park, which became Lincoln Park in 1917. The space that was not used for the ball park became the Horsley and Bostock Zoo, which opened in 1914. NOTE - PHOTO SEARCH: While photos exist of the Shoot the Chutes and Figure-8 railroad during its Chutes Park days (shown above), none have been found of Luna Park or rides such as Nemo's Trip to Slumberland. If someone has some, please send an E-mail message.